As summer wears on and the days get shorter, you may want to consider how you can make your aluminum dock safer with Lake Lite from Docks Unlimited. Whether you’re coming in on your boat later than expected from a day of fun spent on the lake, or you are taking an evening stroll down your dock, an aluminum deck can benefit from having Lake Lite solar lights on it to keep you safe. We all enjoy a good outing at night on the lake, but sometimes, when it gets dark enough, it becomes difficult to see where you bit of shoreline is when you get back in. It’s at these times that Lake Lite’s dock lights can be a life-saver. The bright white lights of Lake Late guarantee that you won’t run into your dock or another boat and will be able to see exactly where you’re going. Lake Lite’s solar light panels give you an easy way to light your aluminum dock without any hassle of turning them on and off every day. 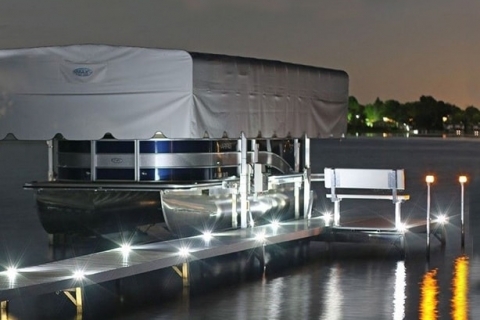 You can light your dock in an energy efficient and green way with little to no effort involved. The bright lights on every Lake Lite solar setup give you plenty of illumination to last you as long as you need for late night boat rides. With the option of getting dock post lights or even pole mounted lights, Lake Lite’s products give you the choices you need to best fit your dock. We at Docks Unlimited appreciate an aesthetically pleasing dock, and with the choices you have through Lake Lite, you can illuminate your dock in whatever way best suits your lakefront. Docks Unlimited has been helping provide boat docks and boat lifts to the Portage and Cement City areas since 2004. Our experience and determination means we treat our clients with respect and give everyone the best experience working with us as possible.